California-based company Vizio announced Monday its plans to incorporate Netflix onto the next firmware update to the Vizio tablet. The new update will allow members to log into their Netflix account for instant browsing and streaming. “With an abundance of movies and TV shows to offer, Netflix is the ideal application to pre-load on our VIZO Tablets,” said Vizio Chief Technology Officer Matt McRae in the press release. The 8-inch Vizio tablet, however, does not currently include models with 3G or 4G support, so the streaming will only be available where WiFi hotspots are in range. Those who do not have a Netflix account in the U.S. can always subscribe for $7.99 per month. Users will be granted access to the large library of TV and movie programs for streaming currently offered by the service. The news comes two months after the official announcement of Hulu Plus support for the Vizio tablet. With both well-known streaming providers under its belt, Vizio will certainly have a leg up in the media tablet competition. The Netflix update should be available now for all Vizio tablet owners. Released in July, the tablet includes a single-core 1GHz CPU, Android Gingerbread, 512MB RAM, 1024x768 resolution screen, 3 built-in speakers, microSD reader and an IR blaster. The unit is intended to stay indoors as a central controller for home media devices. A 4GB model currently sells for just $289 on Amazon. IRVINE, Calif., Oct. 10, 2011 /PRNewswire via COMTEX/ -- VIZIO, America's #1 LCD HDTV Company*, announced today that VIZIO 8" Tablets will receive a firmware update featuring Netflix as a pre-loaded app, offering Netflix members the ability to enjoy entertainment on a second screen. With the new update, members can simply click on the app already located on the Tablet's home screen and log into their Netflix account to browse and instantly watch TV episodes and movies. Streaming instantly via the VIZIO Tablet wherever Wi-Fi is available, the pre-loaded Netflix app makes instantly watching TV episodes and movies on their Tablet more portable than ever. With more than 25 million members globally**, Netflix is the world's leading Internet subscription service for enjoying movies and TV shows. For $7.99 a month, Netflix members can instantly watch unlimited TV episodes and movies streaming over the Internet to many different types of devices. VIZIO Tablet users who also own VIZIO Internet Apps® enabled HDTVs and Blu-ray players can conveniently pause and resume Netflix TV episodes and movies between devices. "With an abundance of movies and TV shows to offer, Netflix is the ideal application to pre-load on our VIZIO Tablets," said Matt McRae, VIZIO Chief Technology Officer. "Adding its expansive library to our mobile platform provides consumers with even more entertainment options to conveniently watch while in the comfort of one's home or while on-the-go." Streaming from Netflix continues to grow. It is due to this demand that VIZIO chose to pre-load the Netflix app onto the Tablet. 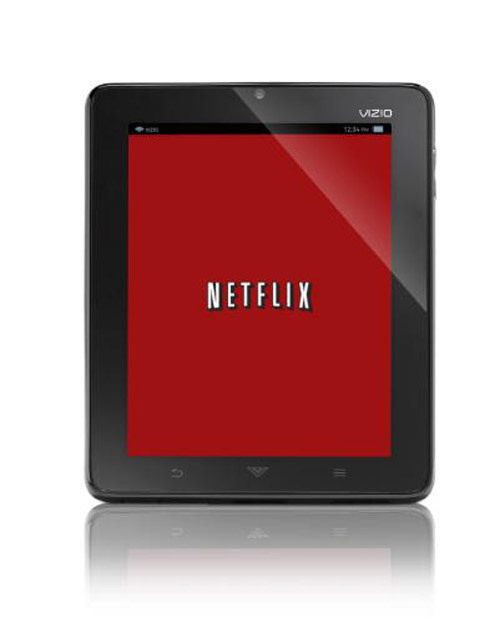 Offering users a media-centric experience, the VIZIO Tablet is a perfect device to enjoy what Netflix has to offer. * Source: IHS iSuppli Corporation Research Q3 2011 Market Tracker Report of Q1 & Q2 2011. About VIZIOVIZIO, Inc., "Entertainment Freedom For All," headquartered in Irvine, California, is America's #1 LCD HDTV Company. In Q2 2007, VIZIO skyrocketed to the top by becoming the #1 shipping brand of flat panel HDTVs in North America and in Q3 2007 became the first American brand in over a decade to lead in U.S. LCD HDTV shipments. Since 2007 VIZIO LCD HDTV shipments remain in the top ranks in the U.S. and were #1 for the total year in 2009 and 2010. VIZIO is committed to bringing feature-rich consumer electronics to market at a value through practical innovation. VIZIO offers a broad range of award winning consumer electronics. VIZIO's products are found at Costco Wholesale, Sam's Club, Walmart, Target, BJ's Wholesale, and other retailers nationwide along with authorized online partners. VIZIO has won numerous awards including a #1 ranking in the Inc. 500 for Top Companies in Computers and Electronics, Fast Company's 6th Most Innovative CE Company of 2009, and made the lists of Ad Age's Hottest Brands, CNET's Editor's Choice, CNET Best of CES 2011 - Television, IGN Best of CES - Television, Bluetooth.org Best of CES, Good Housekeeping's Best Big-Screens, PC World's Best Buy, Popular Mechanics Editor's Choice and OC Metro's 10 Most Trustworthy Brands among many other prestigious honors. For more information, please call 888-VIZIOCE or visit on the web at www.VIZIO.com . The V, VIZIO, VIZIO Internet Apps (V.I.A. ), Theater 3D, Full Array TruLED, Edge Lit Razor LED, 240Hz SPS, 480Hz SPS, Entertainment Freedom and Entertainment Freedom for All names, logos and phrase are registered or unregistered trademarks of VIZIO, Inc. All other trademarks may be the property of their respective holders.